When there are some glittering launches happening at the Auto Expo, there are some to-be-launched cars that are also being spied somewhere or the other. Chevrolet CN100 MPV was caught in some lenses recently and it appears to be the same China version that Chevrolet Motors is trying to pull in India. The Chevrolet CN100 MPV price could land between Rs 6 lakh to Rs 7 lakh. The seven seater Chevrolet CN100 MPV is a product of the partnership between General Motors and China based carmaker Shanghai Automotive Industry Corporation. If sources are to be believed it will be launched soon may be in this Auto Expo itself. Once in the MPV is going to shatter the turf of Mahindra Xylo, Tata Winger and even Maruti’s new MPV. 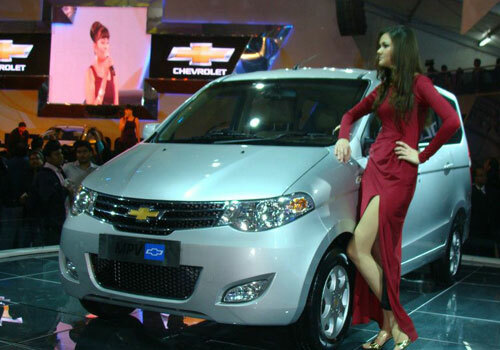 The India based model of the Chevrolet CN100 MPV will be manufactured at the Talegaon plant of General Motors in Pune. As per initial information, a 1.3L multijet engine that has been sourced from Fiat will power this MPV and this could be a revised 90PS engine that could replace the earlier. Looking at the Chevrolet CN100 MPV one feels that it will have much space inside however, the exterior throw the same mundane box like mage. The MPV will be able to seat seven people comfortably and an eighth person can also fit in at the middle. The rear seats are folding type making space for storage. The high end trim will be equipped with most modern features such as keyless entry, Anti-lock Braking system, airbags for the safety of the driver and the passenger and an integrated audio system. Apart from this the MPV will also have the comfort features like extra cushioning and there is enough head and leg room for the passenger at the middle and rear as well making it a hit for large families who consider the Maruti Eeco is too small for their family and the Tata Winger and Toyota Innova are out of their reach.